Remington 700 - No. 1 Bolt Action Rifle | Numrich Gun Parts Corp. The Remington 700 is an elite bolt-action rifle with a reputation for impeccable long-range accuracy and reliability. Development of this rifle established Remington as the pioneer of the 3-rings of steel receiver. This creative design essentially encases the cartridge in a recessed bolt face and completely surrounds the bolt shroud within the barrel, which in turn is threaded directly into the receiver. This provides the Remington push-feed bolt-action with a high level of protection against case rupture and boasts the industry's fastest locktime for a bolt-action rifle, hence promoting a consistency with repeated shots by limiting the shooter's movements. First introduced in 1962 the 700 came in two variations, the ADL and BDL. The primary difference between them is that the ADL has a blind magazine well and the BDL a hinged floorplate. The other distinguishing features on those early models lie in the quality of the wood, checkering, and metal finish. Both were offered in the most popular short and long action calibers of the time, which included the very first chambering of the 7mm Remington Magnum caliber. Offering such choices enabled the rifle to find immediate favor in the sporting world. The Model 700 has been a favorite of competitive shooters and hunters for decades now, but no one has had to place more trust in its performance than our military snipers. It didn’t take long after its introduction for the United States Marine Corps to recognize the quality of the 700. It was quickly chosen for testing and sent off to the Marine Corp Armorers, where it underwent modification for military use. Ultimately it was selected for service in 1966 and the USMC designated the Remington bolt-action as the M40. A year later this precision rifle was in the hands of military snipers serving in Vietnam and rapidly becoming the weapon of choice for some of the military’s most skilled shooters. Although U.S. snipers had been deployed in previous conflicts it wasn’t until Vietnam that their accomplishments began to be recognized and accurately recorded. Their role required specialized training and despite being elite riflemen, they would be prepared for battle well beyond the task of long range shooting. 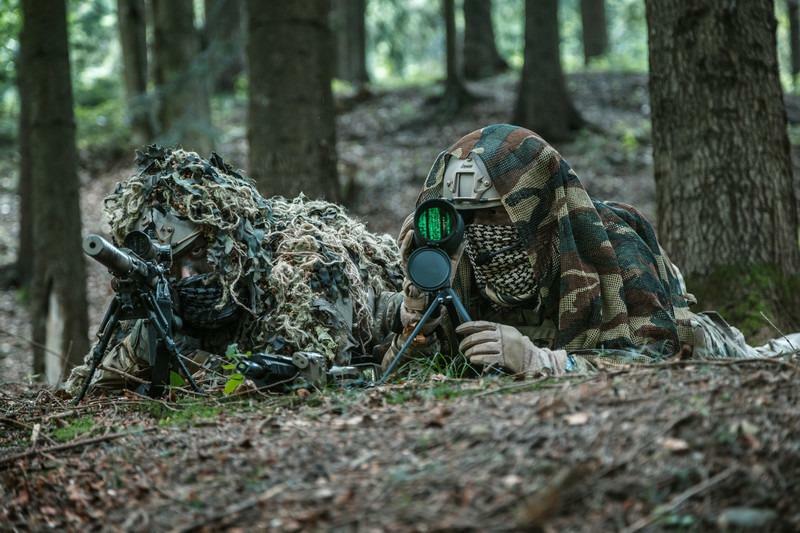 They became efficient at reconnaissance, camouflage, surveillance, and target acquisition among other things. The eyewitness accounts of their accomplishments by fellow servicemen made them near celebrities among the troops and civilians alike. The number of successful shots and the range at which they could be effective was astounding compared to previous conflicts. This was no doubt at least partially accredited to the high quality rifles they were using and the advanced optics that they were now equipped with. For the purpose of acquiring and engaging a target over a long distance, the M40 was a vast improvement over the M1C and M1D used in WWII and Korea. These rifles were essentially just modified M1 Garand semi-automatic rifles fitted with riflescopes. However, the M40 like any other weapon that is placed into service, would reveal its flaws when put to the test in combat. One of the things discovered with the M40 in Vietnam was that its one-piece wooden stock tended to warp from long term exposure in the damp Vietnamese jungle. In the early 1970’s this issue was addressed by making a switch to a fiberglass McMillan stock. Other improvements were also needed but the 700 action performed well and remained at the core of the rebuild. The work again took place at the USMC Armorers facility in Quantico, Virginia and the new version was designated as the M40A1 in the early 1970’s. We can’t possibly incorporate every sniper worthy of mention here and still cover the Remington 700, but we would like to skim the field of these top-notch riflemen, especially a couple of those that favored this great rifle over all others. Charles ‘Chuck’ Mawhinney was just a kid fresh out of high school when he shipped off to Vietnam. After three months in combat, he was assigned to the 5th Marine Regiment HQ Scout Sniper Platoon. During his next 13 months he watched over his fellow soldiers as a Marine Sniper while compiling an exemplarity service record. The weapon that he used for the majority of the time was his M40, a modified Remington 40X (target/varmint version of the 700) rifle equipped with a Redfield 3-9X Accu-Range scope. Mawhinney became best known for halting an advance of a large number of enemy troops as they encroached on his Marine Platoons position. Mawhinney has also been featured on the History Channels television special “Sniper Anatomy of the Kill” where Marines recreated one of his more incredible long-range shots. The M40 that Mawhinney carried is currently on display at the National Museum of the Marine Corps in Virginia. The most accomplished sniper of the Vietnam era according to the U.S. Military was Staff Sergeant Adelbert Waldron III. Waldron primarily used the M21, which was a modified M14 (the short-lived standard issue automatic battle rifle). Why mention Waldron if he didn’t favor the 700 you may ask? Well, his relevance lies in that record setting deployment. His milestone remained intact as the most accomplished American Sniper for nearly 40 years, that is until he was surpassed by possibly the best known sniper of all time, Navy Seal Chris Kyle. In his 4 tours to the Middle East, over the course of his 10 years of service, Kyle compiled a staggering service record. Chris Kyle exceeded Waldron’s accomplishments and gives a full account in his best selling novel “American Sniper”, but he believed that if the Navy accurately confirmed his record it would be even greater than recorded. His rifle for much of his time in battle was the U.S. Army M24 SWS (Sniper Weapon System) chambered in the .300 Winchester Magnum caliber. During his 4th and final tour, Kyle was armed with the M24A3 chambered in .338 Lapua Magnum. Like the Marine’s M40, the Army M24 is a modified Remington 700. The biggest difference between the two being the action length; the M40 is a short action (eg: .308 caliber a.k.a. 7.62x51mm NATO) and the M24 is a long action. Over the years the Marines would make additional changes to their M40, but at its core would remain the Remington 700. In that first upgrade with the M40A1 they also included a custom made Hart barrel. The work began on an M40A2, but the military never saw fit to adopt it in any real capacity. The same would happen later with the M40A4. In 2001 they revamped the rifle for a third time and created the M40A3. This time they chose an updated McMillan stock, Schneider match grade 24” barrel and revised the sling and buttpad. The final improvement on the M40A3 was the Schmidt & Bender Marksman II LP Scope. The most current variation of the Marine Sniper Rifle is the M40A5, which includes a few features that have helped make the rifle more accommodating to the soldiers' needs and more accurate than ever before. The M40A5 now has a 1-12 twist, 6 groove, stainless steel Schneider barrel with a straight taper, and a threaded muzzle to accommodate a muzzlebrake or suppressor. It is also fitted with a Badger Ordnance M5 DBM trigger guard with a 5-round magazine. The PGW PVS-22 Night Vision Mount has been installed on the lightweight McMillan A4 Stock, which features an adjustable saddle cheek, Spacer System LOP adjustment, and has a green molded-in color. The scopes used on the M40 variations have been many, beginning with Redfield 3-9X Accurange scope like that used by Mawhinney, or the 10X Unerti fixed power scope that replaced it, and various power Nightforce scopes, which were referenced by Kyle when asked about his service rifles. The U.S. Army provided the outline, but contracted Remington to build their Sniper Weapon System. One of the unique details about the M24 is that they were built for long action, despite their initial chambering in 7.62x51mm (.308). This was done at the request of the Army’s Special Operations personnel, because even back in the 80’s when the M24 was built, some in the Army already felt that they may someday need the extended reach of the .300 Winchester Magnum. Almost as if they were foreshadowing that they would eventually be going to battle in flat or wide-open terrain. The M24 specifications included a free floating slightly tapered heavy barrel and a steel trigger guard and floorplate made by Dakota Arms. It also had an externally adjustable trigger, and a Kevlar-reinforced fiberglass stock that was designed in a joint effort by Remington and H-S Precision. The stock featured a knob adjustable buttplate, high non-adjustable comb, and dual palm swells. The Army also required the rifle be equipped with back-up iron sights, which were first furnished by Redfield, but are now made by OK Weber on later rifles. The scope that came with the Army’s sniper rifle was a Leupold MK IV M3 10x42mm with a Mil-dot reticle. Like the Marines, the Army never stopped pursuing improvements. The first variant was the XM24A1 (their first attempt at chambering the .300 Win Mag) was not adopted. The next effort was the M24A2, which displayed a few notable improvements. These included a new stock from H-S Precision featuring an adjustable cheek rest and length of pull, a modified barrel to accommodate a suppressor, and the MARS (Modular Accessory Rail System) Picatinny rails. In the commercial realm, the Remington 700 has been consistently one of the top-selling bolt-action deer rifles. As with the militarized versions, slight changes have taken place with various components, but the heart and soul of the 700 action has remained intact. Since its inception in 1962, the 700 has been offered in 47 different calibers as part of over 900 variation/caliber combinations, which were created to suit the needs of many different shooters. They even attempted a short stint into the muzzleloader market, but sadly the Model 700ML didn’t really appeal to the masses and production was halted after about a 7 year run. Their current catalog still offers variations of the 700 in ADL and BDL styles, as well as sub-models geared towards everything from varmint and long range, to tactical applications. Despite the lingering controversy regarding accidental discharge accusations with both their Walker trigger and X-Mark Pro trigger systems, which perhaps we will discuss further in another article, the 700 continues to arguably be the most popular sporting rifle of all time. Estimates of production now exceed 5 million rifles over the last 50 plus years. This top selling bolt-action rifle took both the military and hunting communities by storm since day one. With the list of industry first introductions, such as chambering in 7mm Remington Magnum, its 3-rings of steel, and its hammer forged barrels, the elite rifle drew a lot of attention to itself and overall has performed pretty darn well. As hunters we love choices, especially in caliber and that is something that Remington capitalized on with the 700. As far as our Military Snipers, they need accuracy and reliability above all else, and they certainly got it with their militarized versions of the Remington rifle. There has definitely been other great bolt-actions and some even met the demands of the military. The Winchester Model 70 for example was a sniper rifle for a while and is and has been for a very long time a popular deer rifle. Anyone that has ever read Jack O’Connor’s articles in Outdoor Life Magazine can attest to that. However, the Remington 700 continues to be an industry leader in spite of all the competition, even the economical bolt-actions that are available today, and there are many. The Ruger American, Mossberg Patriot, Savage Axis and even Remington’s own model 783, and the like, have all begun taking their share of the market. But are they comparable to the 700? Perhaps depending on your needs, however one cannot help but feel a boost of confidence when heading into the woods holding the same rifle in your hands that Chris Kyle used in combat. So if the price tag isn’t the primary concern, we would suggest at the very least experiencing the difference for yourself by shooting a variant of the rifle that the U.S. snipers use.